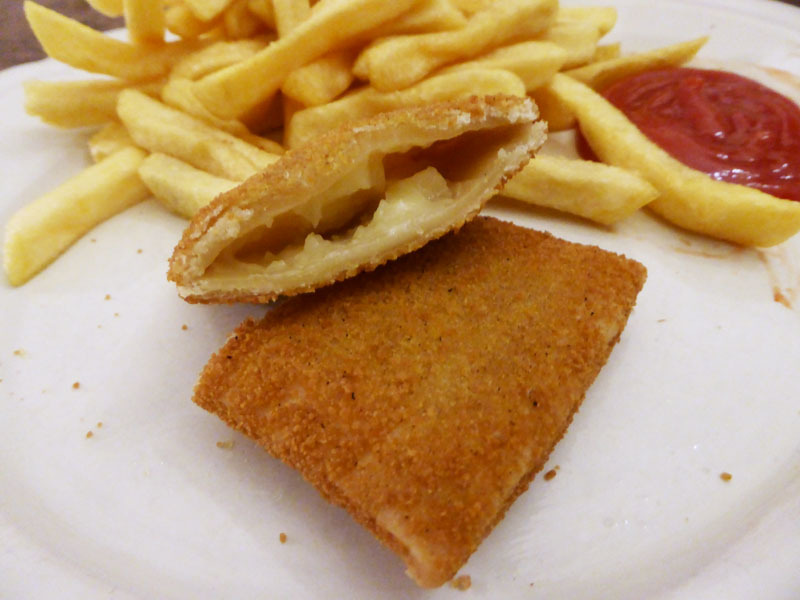 The snack is made by wrapping a slice of cheese in puff pastry, coating in breadcrumbs before deep fat frying. They got the soufflé name due to how they quickly expand when placed in the hot oil. Generally they are either hemispherical and look like a pasty, or rectangular like a pop tart. They are usually made with a Gouda-like cheese filling, making them one of the few vegetarian dishes offered at Dutch snack bars. But you can also sometimes get other varieties, such as a ham-kaassoufflé which has a slice of ham alongside the cheese filling. You may also be served mini-kaassoufflés at a borrel; they are exactly the same but on a smaller scale, and often accompanied by a selection of other mini Dutch snacks such as bitterballen (essentially mini kroketten), mini–frikandel etc. A kaassoufflé is usually eaten on its own, but is also nice dipped in mustard, regular ketchup, or curried ketchup. A broodje kaassoufflé is the snack served in a bun. The snack itself is not difficult to make at home: some puff pastry, sliced cheese, an egg and breadcrumbs and you’re ready to go, but you will need a deep fat fryer. Take your puff pastry from the freezer and cut the square slices in half so you have two rectangles. Layer 3 cheese slices together and trim so it fits inside the rectangle puff pastry, leaving a 0.5cm space around the edge. Wet the edge of the puff pastry and place the other half on top, pressing around the edge so they stick together. Whisk the egg and pour onto one plate and put the breadcrumbs on another plate. Dip each kaassouffles in the egg and then into the breadcrumbs for an even coating. Place a couple at a time into the fryer until golden brown on both sides, flipping over halfway. Alternatively you can purchase readymade ones from the freezer section of most supermarkets; some will be for in the home fryer, air fryer or oven.